COCOA, Florida - Cocoa Police detectives are attempting to identify two suspects wanted for a burglary that occurred at approximately 1:30 a.m. on September 23, 2017, at the TNT Beauty Supply store located at 817 North Fiske Boulevard in Cocoa, Florida. Police say that the suspects forced their way into the business by breaking the front glass door. 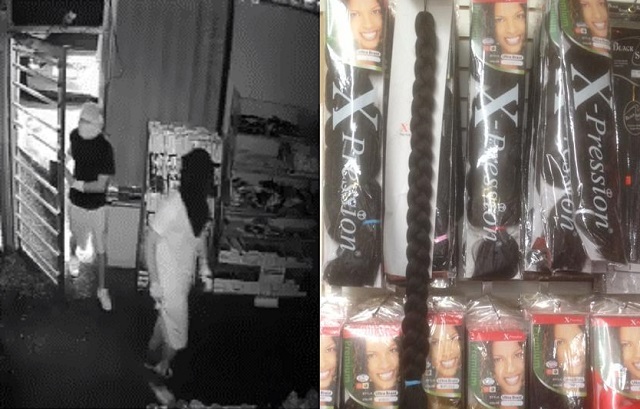 Once inside the business, the beauty burglars stole approximately $8,000 in merchandise including a significant amount of hair extension inventory. According to witnesses, the suspects were in a light-colored vehicle, possibly silver. Both suspects wore gloves and covered their faces.